I took the time to write a short rebuttal directly on Michael Marcus’ blog where he posted his “negative” review of “TurnKey Publishing”. As of this writing, he has not yet “accepted” my rebuttal. However, you can read below my short rebuttal meant for posting on his blog. 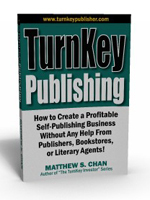 Thank you for taking the time to review and write about my book “TurnKey Publishing”. It is clear we disagree philosophically on many points. I will be preparing a more complete rebuttal of the points you raised but allow me some short rebuttal statements. 1. I began writing this book in 2008 and had to slide in and squeeze in last-minute information updates in 2009. 2. In 2008, CreateSpace had just debuted then and very few people had any real-life experience with CreateSpace. 3. While Lightning Source and their print-on-demand system was fairly well-established in 2008, offset printing still existed and was still a valid option. Hence, I do discuss my experiences with that. 4. I tell people I am from “outside” the traditional publishing industry. In fact, I am also “outside” the self-described “self-publishing” industry because it does not accurately what I do or represent. 5. 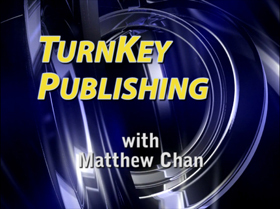 “TurnKey Publishing” is part of a larger series. In Part 2, I discuss the other important part of my business, Audio Publishing. Specifically Audio CDs. Yes, I know CreateSpace produce Audio CDs but they are very limited in its production and packaging options. Hence, Amazon Advantage is still an important part of my overall business for that portion. Amazon Advantage also allows for spiral-bound material that CreateSpace does not. 6. Almost every book I have ever read (including many from the huge NY publishing houses) have some kind of errors even with all their well-paid editors and proofreaders. Book publishing is simply an unforgiving format for this sort of thing. 7. I appreciate that you have not made personal attacks against me. You have restricted your remarks to what I wrote, how I wrote, and the presentation. You have given me the opportunity to open a dialog with my readers. Those are the high-point rebuttals. I will have a more complete rebuttal later.